Rescue workers transfer the body of a man who died on Vallecito Creek Trail on Saturday from a San Juan County, N.M., helicopter to an ambulance. A Darien, Connecticut, man died from a suspected blockage of the pulmonary artery late Saturday afternoon on Vallecito Creek Trail. La Plata County Coroner Jann Smith identified the man as Harold Amyotte, 55. He was known as Harry Amyotte. Amyotte was backcountry hiking with his wife, daughter, son and his son’s girlfriend when he went into cardiac arrest, said Chief Bruce Evans with the Upper Pine Fire Protection District. The son ran down the trail to call for help as the family performed CPR on the man. 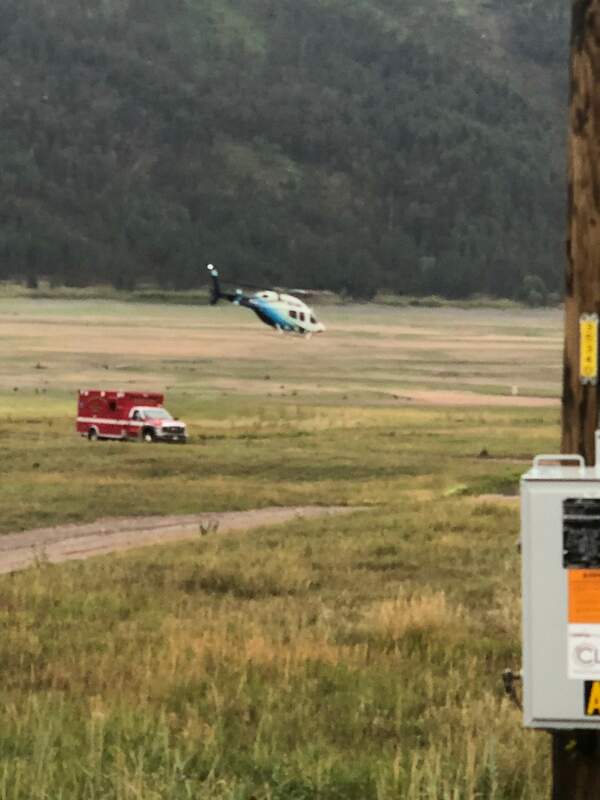 The Upper Pine River Fire District received the call at 4:37 p.m. La Plata County Search and Rescue was called for mutual aid, but the call was later canceled. A San Juan County, New Mexico, helicopter responded to aid in retrieving the man’s body from the trail, Evans said. Smith said an autopsy will be conducted this week to make a final determination of cause of death.